I used to be able to do these tasks with my eyes closed with AIX and other version of Linux and Unix. Today my brain blue screened on me while trying to expand my Ubuntu machine's root volume group, logical volume, and filesystem. Wow it's been awhile. So instead of racking my brain in the future I will jot down the process here for anyone else stuck in the same situation. In my scenario I increased the size of my Virtual Machine disk in VMware from 18GB to 28 GB. Accept the default values that are provide that the "n" option returns. Step 3 Reboot your Ubuntu machine in order for Ubuntu to recognize the change. 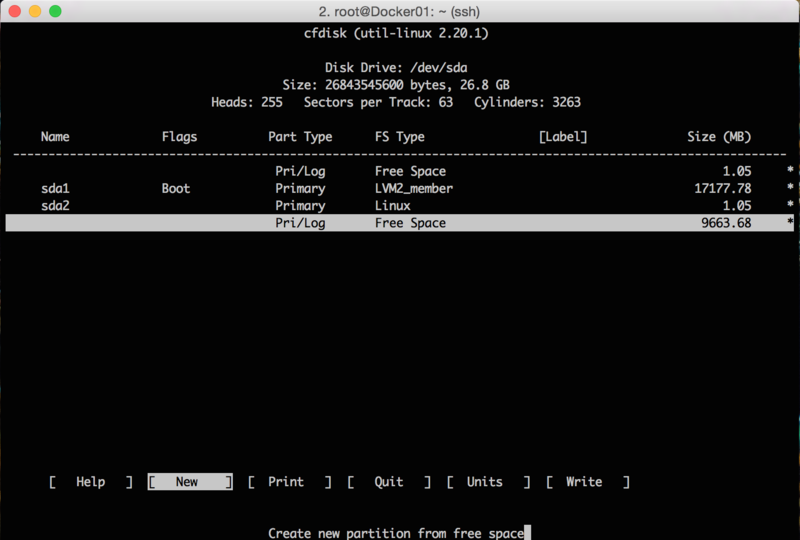 Step 4 Update the partition table tool using cfdisk. Select [NEW] partition and [PRIMARY] for partition type. Select how big you want the partition and enter. Once finished select [WRITE] to save your changes to your partition then [QUIT]. "/dev/sda3" is a new physical volume of "9.00 GiB"
The filesystem on /dev/mapper/ubuvg-ubulv is now 4871168 blocks long. Hopefully this tutorial will save you time and give you a little more background on the flow of a resize. Important to remember is the path of the resize Physical Volume -> Volume Group -> Logical Volume -> Filesystem. We must follow this flow or the resize will either fail or encounter problems. If you use the Ubuntu GUI some tools contain the entire process in a single tool. I'm a CLI junkie so no plans of me finding out how a GUI works anytime soon.